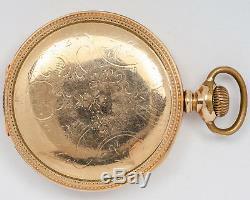 Up for sale is an antique Illinois Watch Co 16 size 21 jewel adjusted Sangamo (marked SPECIAL) with a gold filled double backed HUNTING case out of an estate! 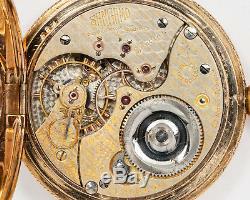 The TWO TONE Grade 4 lever-set movement is marked: Sangamo Illinois Watch Co. Springfield Special Double Roller 21 Ruby Jewels Adjusted Temperature 6 Positions Isochronism 1953104. 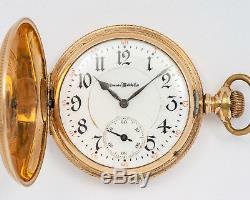 The movement features the "straight ribbon" damaskeening, gold jewel settings, a gold train, and the serial number dates to 1907. 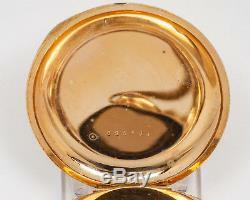 The double-sunk dial is marked: Illinois Watch Co. 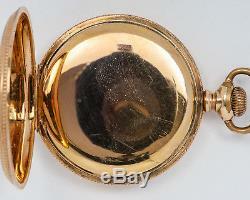 The dial is in fair condition with hairlines and chips in the finish - see photos. The case is in good condition, no significant areas of wear-through other than around the crown/bow, and the hinges are nice and tight. Inside the case back is marked: 635564. 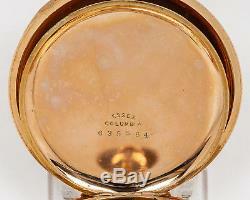 Inside the dust cover is marked: Essex Columbia 635564. The watch is running, and winds/sets properly. We do not know the service history, and can not guarantee the time keeping on the watch. We only sell guaranteed 100% authentic high end Swiss wristwatches and accessories. The item "Antique 1907 Illinois 16s 21j Adj Sangamo with Hunting Case & Two Tone Movement" is in sale since Friday, June 15, 2018. This item is in the category "Jewelry & Watches\Watches, Parts & Accessories\Pocket Watches\Antique". The seller is "djpropel" and is located in Oklahoma City, Oklahoma.